Official figures show that in punctuality terms South West Trains has become "South Worst Trains". The deterioration is such that it is nearly a better than even chance that a train will not arrive on schedule. A South West Train at Chiswick station. In the period covered by the report South West Trains was the worst performing train service in the country. One regular user of Chiswick station said, " I'm sure the figures mask a much worse performance for the suburban lines like the Hounslow Loop. The fast trains always seem to get priority." The figures are likely to provoke a bitter response from many Chiswick residents following recent comments from Hounslow Council that they pay higher CPZ charges because of "generally better" transport links. 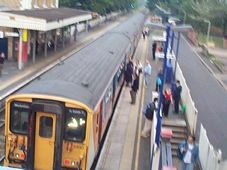 The award of a new franchise does commit South West Trains to increase the regularity of the service through Chiswick before 2004. South West Trains also have the biggest commitment to order new stock of any of the train operating companies. South West Trains claim that the volume of trains going into Waterloo makes punctuality difficult as the station has a bottleneck on entry. Want to contact South West Trains about this matter? Most of the articles on this site are contributed by local people. London & South East and Other Operators show % arriving within 5 minutes of timetabled time. Would you use the Piccadilly line from Turnham Green?